We are specialists in exotic and tropical fruit trees, and in the ideal climate and care for each variety. Let us help you pick great trees in the right size and maturity. We have over 200 different varieties of exotic tropical and rare fruit, nut and flower trees – including dozens of different citrus trees, and multiple varieties of cherry, fig, mulberry, avocado, apple and guava trees and much more! We are known for our variety of mature trees sized from fifteen gallons to 65 gallons and larger that allow you to enjoy the fragrance, color and full-size presence of the specimen, right now. This makes us a popular choice among landscape contractors wanting a time-saving one-stop-shop with quality, healthy trees that their customers will love. It also makes us popular destination among homeowners wanting healthy, well-grown trees with the proper presence -- without waiting, whether a single tree or an entire orchard. There is no one in the area with a larger or more robust selection of varieties and sizes of mature tropical fruit trees. We also have many varieties in one and five gallon sizes, to allow you to experience the growth over the decades at a budget that fits your needs. Our selection is wider and our value is greater than other nurseries. Our trees are in appropriate-sized containers, which also makes delivery and placement easier and/or less expensive. Let us guide you in everything you need to know about growing container fruit trees. Planting or growing trees in containers is popular in southern California. High property values in San Diego, Los Angeles and Orange County and surrounding areas means many homes were built to maximize the size of the house on the lot, leaving landscapes with little or no outside space to plant trees. The good news is you don’t need a large property to grow a great tree (or trees)! Container-grown trees are great on porches, balconies, entryways, decks and patios. 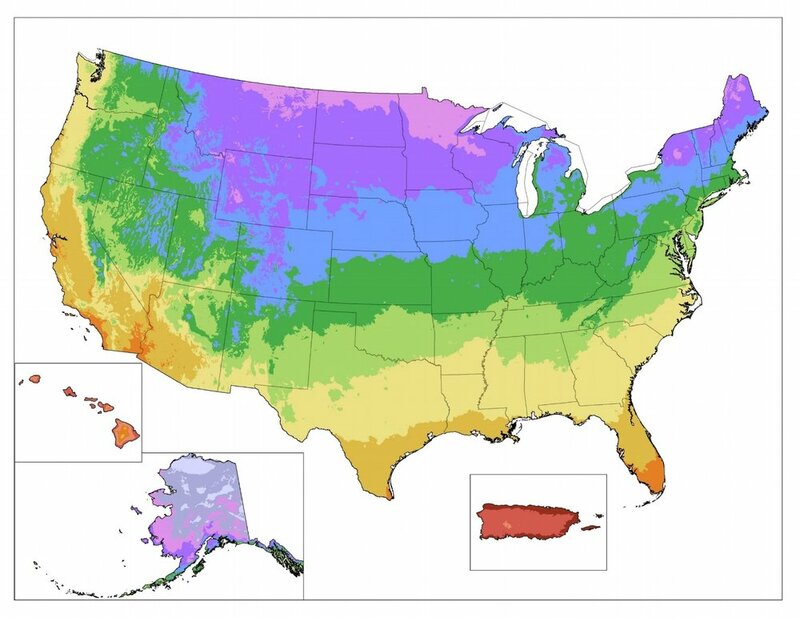 For more information on the USDA Plant Hardiness Zone map, including a by-zip code search tool, click here.